Gerbera daisies thrive as a perennial in areas with mild winters or as a bedding or potted annual in areas with cold winters. The large, colorful blooms add an exotic touch the garden. Once the flowers begin to wither, they can make the bed look ragged and unkempt. Withering also means the gerbera has begun to form seeds. Once seed formation begins, the plant stops producing new blooms for the season. Encourage the gerbera daisy to continue to bloom all summer long by deadheading the flowers as soon as they fade. Inspect the gerbera daisies once a week during the blooming season. Look for flowers that are beginning to wilt and for seed heads that have already begun to form after the petals have fallen off. Rinse a pair of small garden shears in a solution of one part bleach combined with nine parts water. This sterilizes the shears so no disease organisms are spread to the gerbera during deadheading. Cut off the stems supporting the wilting flowers and seed heads with the shears. Cut the stem off where it emerges from the foliage at the base of the plant. 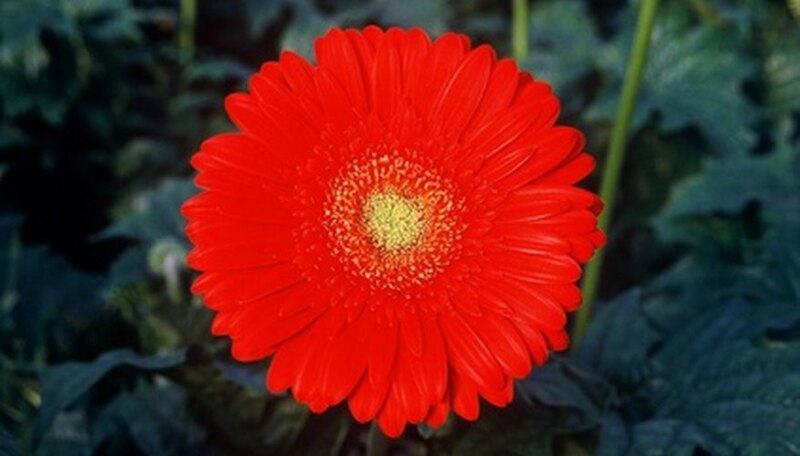 Gerbera daisies only produce one flower per stem, so whole stem removal keeps the plants looking their best. Remove the trimmed flower heads and stems from the flower bed and compost or dispose of them. Leaving dead plant matter in the bed can cause a breeding ground for diseases such as botrytis blight. Trim off any dead or damaged leaves you notice when you are deadheading the daisies. This also helps improve the appearance of the bed. Leave a few flowers to go to seed if you want to save the seeds for replanting the daisies the following year.